A suspected burglar who died of multiple injuries in a launderette has been named. Paul Robertson, 39, of Milton Keynes, suffered "blunt force" injuries at Baylee's Launderette in Grays. 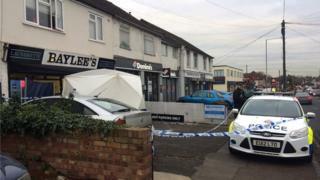 Essex Police believe he was among up to five people armed with weapons who went into the launderette on Monday night. The force arrested a 35-year-old man from Milton Keynes on suspicion of aggravated burglary. The arrest is the third in connection with the case. A 39-year-old Grays man and a 28-year-old man from Watford have been released pending further inquiries. It is believed the others fled the scene after Mr Robertson was fatally injured.